Once the weather conditions begins to cool, it’s time for you to schedule a heat pump servicing. You should prepare your devices some time before wintertime arrives for a number of reasons. Conserving money: Yearly tune-ups are considerably less expensive than the repair or replacement service. Your system will be more cost-effective, which lowers your power bills. Make repairs or improvements: Have an experienced technician evaluate the condition of each and every element of the system and recommend any needed fixes or upgrades prior to winter. Cold temperatures cuts down on the efficiency of the heat pump. That’s because your internal coils need to start generating heat to add to the heat in the air, so it’s essential that they’re clean and in good shape. Testing airflow: In accordance with Energy Star, over fifty percent of the heat pumps within the U.S. have substantial issues with low airflow and leaking ducts. Certified technicians will test ventilation with state-of-the-art instruments to uncover and correct any problems. Sizing and fixing ducts: Defective ducts makes it possible for as much as 30 % of one's treated air to leave before it gets to the intended area. Therefore, issues with your ductwork really need to be identified so you comprehend any performance problems and prepare for repairs should they be needed. Cleaning and replacing of filters: This should be done every 2 to 6 months, but particularly at the start of the heating time of year. Cleaning your system thoroughly: Every single component part ought to be properly cleaned out and cleared of all the dirt. That also includes the entire evaporator coil, condensate tray, outdoor coils, supply and returning registers, blower fan rotor blades as well as the space around the equipment. Examining the motor and belts: The inner parts should really be examined to ensure they are in very good repair with plenty amount of lubrication where it's required. Testing electrical and protective controls: All of the controls and electrical wiring ought to be tested to ensure they are working properly and accurately. 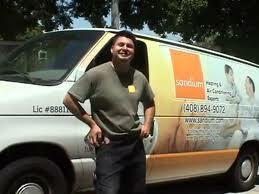 To schedule heat pump maintenance for your home, contact your local Sandium heat pump specialist. We provide expert HVAC service to the South Bay Area and surrounding areas.